A man in his late 60s is brought to the emergency department (ED), unconscious after being involved in a single-car traffic accident. An initial trauma assessment reveals the patient's blood pressure is low. Using bedside, point-of-care ultrasound, emergency physicians diagnose a 6 cm abdominal aortic aneurysm, which is most likely what caused the patient to pass out while driving. Without this rapid diagnosis, the patient's treatment may have gone much differently. When patients are brought through the ED doors with conditions that aren't immediately obvious, are short of breath, or are unconscious and unable to speak to help narrow the differential, emergency medicine physicians need a tool to quickly and accurately diagnose the problem and come up with a solution. As with the case described above, ultrasound can be a powerful tool emergency physicians use to promptly diagnose and treat various medical mysteries. "The stethoscope still has its place, helping us in areas where we can't see what's wrong. Ultrasound in emergency medicine isn't replacing anything," says Laleh Gharahbaghian, MD, FACEP, director of the emergency ultrasound program in the ED at Stanford Hospital. "But with this tool we can scan a patient from head to toe and skin to organ, quickly, in an attempt to determine what's causing them pain, where they are injured, and why they are in a shock state." According to Gharahbaghian, as ultrasound image quality and education improve, the modality is being used by many emergency medicine physicians. At the same time, those clinicians practicing emergency ultrasound say their use of this modality isn't meant as a replacement for radiology in the ED. "We're not doing complete ultrasound studies all the time," says Christopher Raio, MD, FACEP, an emergency medicine specialist at North Shore University Hospital in Manhasset, New York. "In the ED, we're often looking to answer a specific question regarding what's causing a patient's medical distress. Often, we refer the patient for a radiology- or cardiology-performed exam at a later time." In the case of a cardiac patient, for example, Raio says that he would use ultrasound to look for global or regional wall motion abnormalities or fluid around the heart. Cardiology studies later may look for more minute issues. "We're looking to answer basic, time-sensitive questions regarding the patient's condition," he says. "We can use ultrasound right when the patient enters the ED, with the machine at the bedside. For acute patients suffering chest pain or shortness of breath, we may have received advance notification from paramedics while the patient was being transported to the hospital and can be ready with ultrasound when they arrive." Lung exams are another example of the expanded scope ultrasound offers to emergency physicians, Gharahbaghian says. While a chest X-ray is helpful in detecting certain problems within the lung, she says ultrasound can uncover more issues and with greater speed than an X-ray. She explains this as a matter of ultrasound's capacity to see pathology with much greater sensitivity and specificity in its ability to distinguish between fluid and solid consolidation. In the case of lungs, there's an urgency to find anything wrong in the air that fills the lungs. "This is especially important when dealing with emergency patients who present with acute symptoms, such as shortness of breath," she says. "We need to quickly rule out emergent cardiac or pulmonary conditions while taking the ultrasound findings and applying it to clinical diagnosis. It takes longer to get a portable chest X-ray at the bedside than it does to perform an ultrasound. With ultrasound, we can diagnose and intervene sooner, potentially avoiding intubations or patient admissions to the ICU [intensive care unit]." Ultrasound's traditional strengths suit it for emergency medicine duty, according to Vicki Noble, MD, FACEP, director of the emergency ultrasound program at Massachusetts General Hospital in Boston. "It's a portable technology, it's relatively easy to use, there's no radiation exposure to the patient or the user, and it's less costly," Noble says. "Point-of-care ultrasound used in EDs helps physicians reach a more rapid diagnosis, which is an important factor as emergency physicians face new pressure to complete all diagnostics before the patient is sent upstairs from the ED. "In medicine in general right now there is more pressure to make an immediate diagnosis," she adds. "There's more pressure today on early and round-the-clock diagnostic testing and accuracy." Noble explains that one reason why this might be happening is to help reduce the patient's length of stay in the hospital. It may also be used as a way to reduce costs. The sources interviewed for this article agree that ultrasound use in the ED requires proper education and training. To that point, the Accreditation Council for Graduate Medical Education (ACGME) mandates procedural competency in emergency ultrasound for all emergency medicine residents. According to the American College of Emergency Physicians (ACEP) policy statement on emergency ultrasound guidelines, there are two routes for physicians to receive core training in this area. The first is residency-based training, where residents learn the basics of emergency ultrasound as part of an ACGME-approved emergency medicine residency program. The second avenue is for physicians who already completed their medical education but did not have emergency ultrasound training as part of their residency experience. These physicians can complete continuing education courses and practical hands-on training. "Emergency ultrasound is becoming an embedded part of the four-year medical school curriculum," Gharahbaghian says. "Students are learning how to use ultrasound by incorporating it into their learning of anatomy, physiology, and pathology, while also appreciating the benefits it can bring to the diagnostic process before they even select a medical specialty to follow. Ultrasound will go with them no matter what field they enter." There are also a number of point-of-care emergency ultrasound fellowship programs throughout the country, although fellowship status is not a requirement for routine physician use of ultrasound for core emergency applications. Gharahbaghian says that at Stanford, emergency physicians have been using and teaching the use of ultrasound for so long that physicians in other departments are starting to use the modality as well. The school of medicine incorporates ultrasound into anatomy training for first-year students as well as in courses for preclinical students. Noble's emergency medicine experience spans 15 years and she says ultrasound has always been a tool she uses in the ED. Raio graduated from medical school and completed his residency with ultrasound as part of his black bag of bedside tools. In the time since he completed his residency in 2003, ultrasound has become a core requirement for emergency medicine and he's seen the number of fellowship programs increase from fewer than 10 to more than 90 programs today. However, there is still the need for other specialties to understand this new diagnostic paradigm, Noble says. "We're used to it in emergency medicine, but any time you change the paradigm, physicians in other specialties are going to be more cautious," she says. "Most physicians recognize that the technology change has already happened, and that ultrasound in the ED is in the best interest of the patient." While there is a learning curve to mastering the nuances of using ultrasound, there can also be some hesitancy among physicians, regardless of their specialties, to grab the handheld transducer and start imaging. Overcoming "a fear of the unknown" is a factor, Gharahbaghian says, but it shouldn't be a deterrent. "Doctors know their anatomy," she says. "It's just a matter of teaching them where to put the transducer and how to analyze what they find. And with image quality so good now, it's not that difficult to scan a general area of concern on the patient and find what could be causing the patient's condition. It's not like looking through a snowstorm anymore." 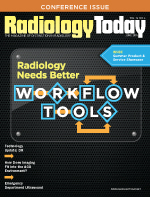 "It might take physicians some time to find their niche when learning to use ultrasound," Noble adds. "But, they know the anatomy and they know what they're looking for in the body. We just have to convince them that what they see with ultrasound is what they already know about the body." Gharahbaghian says that as with any new developments in medicine, clinicians will want to see outcomes from cases where emergency physicians are using ultrasound in the ED. "They will want to see if we're saving patients from lengthy hospital stays and if ultrasound in the ED is helping workflow," she says. "There's also the issue of patient satisfaction and it seems that having a physician at the bedside performing ultrasound enhances the patient's experience in the ED." Regarding the patient experience, Noble was involved in a study published in The Journal of Emergency Medicine that reported that patients who underwent a bedside ultrasound had statistically higher satisfaction scores with overall ED care, diagnostic testing, and with their perception of the emergency physician. As stated in the study findings, "Bedside ultrasound has the potential not only to expedite care and diagnosis but also to maximize satisfaction scores and improve the patient-physician relationship, which has increasing relevance to health care organizations and hospitals that rely on satisfaction surveys." "With point-of-care diagnostics we see that the patients like this," Noble says. "We're able to educate patients about their disease. It brings the doctor back to the bedside." Emergency physicians see ultrasound encouraging a cooperative effort for a variety of specialists at the patient bedside, encouraging more collaboration between physicians and combined care for patients. "We're still working on combining efforts, including labs and imaging, and ultrasound is just a part of that movement," Noble says. "Emergency physicians have the entire clinical picture," Raio says. "We can talk to the patient and we can talk to other specialists who may need to be called in. We're in a position to tie together the patient's medical care." Noble sees the introduction of ultrasound in the ED as an opportunity, not a threat to imaging specialists. "The goal is to find new ways to use ultrasound, to improve the patient experience," she says. The ACEP's policy statement on emergency ultrasound guidelines includes a list of potential applications for ultrasound in the ED: situations of general trauma, intrauterine pregnancy, cardiac distress, abdominal pain, pelvic pain, first-trimester pregnancy issues, soft tissue/musculoskeletal injuries, thoracic issues, and ocular injuries. With the variable nature of the types of medical situations emergency physicians can face, however, some physicians have taken to new approaches. Gerardo Chiricolo, MD, FACEP, director of emergency ultrasound at New York Methodist Hospital in Brooklyn, cites an example of when the best method of visualizing a throat abscess could involve an unconventional use for a standard ultrasound device. "To use a CT scan, there's the risk of radiation to the patient's neck," he says. "And with an MRI, the patient needs to lay flat and perfectly still. But, you can use an endocavity transducer, following the proper guidelines for infection control, to see things in the throat quickly and accurately. "The beauty of ultrasound is that it can go anywhere," Chiricolo continues. "The technology is limited only by the physician's expertise." Gharahbaghian finds it intriguing that there's now so much interest from others in the use of ultrasound in emergency medicine. The practice started 30 years ago, when military physicians used the modality in triage settings to screen for significant injuries. "Use then evolved into trauma centers in the United States and is now expanding from there," she says. Emergency medicine clinicians see that growth continuing, not only throughout health care facilities but also among medical specialties. "When you graduate a generation of doctors who know ultrasound from day one, you've made a huge impact," Noble says. "They will take that knowledge with them into all specialties. There could be a time when ultrasound is just a part of the regular diagnostic process."